A fully tailored car mat set, made specifically to fit the vehicle listed only. They are the same shape and size as an original dealership set, so will fit in the vehicle perfectly. The profile images shown are generally the exact shape that will be delivered, but it may differ slightly due to them being vehicle specific so that they are an exact fit. Please be careful if your vehicle's registration is on a change over year. You may have the older/newer model. 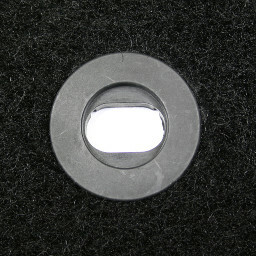 If no image above, the driver's mat "may be" fitted with a central universal clip. A great way of making your set of mats stand out is by having them made in a different colour, quality or adding a contrasting coloured trim. This makes them stand out in your vehicle. These options are easy to make using the drop-down menus at the top. Quality and colours explained below. PAYPAL, GOOGLE CHECKOUT, CHEQUES, POSTAL ORDERS & MOST CARD PAYMENTS. Click the button below to add the Citroen C3 Mk1 (2002 to 2009) Tailored Car Mats (1 Uni Clip) to your wish list.